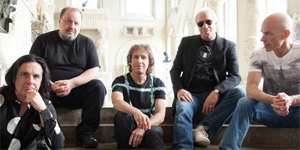 MARILLION has launched their direct-to-fan pre-order campaign for the brand new album today. PledgeMusic are extremely pleased to be working with MARILLION, on what is their 18th album, in running the official pre-order stores from Marillion.com and PledgeMusic.com. Offers include pre-ordering the CD, LP, Deluxe CD, a Special Edition box set and digital formats, with limited edition signed copies also available. A special private show at the band’s Racket Club studios in Aylesbury is also in the listing. Additional special offers will be introduced throughout the campaign and later in the year, once the album is finished, the band will be adding the opportunity to buy tickets to exclusive ‘Listening Parties’ around the world. Throughout and up to the album release, the band will be keeping fans updated with the album’s progress and news from their world through the PledgeMusic AccessPass. MARILLION very much began the direct-to-fan movement back in 1997 when their fans financed a tour of North America. Since then, they have gone from strength to strength and have released the last four of their studio albums in this way. Together with the existing PledgeMusic community of over a million music fans, the ambition is to raise the bar even further and give their fans bigger and better exclusives, experiences and involvement.